... is the kind of name that could easily embarrass a person placing a drinks order. And when this, ahem, interesting bottle shows up, well, it ain't going to be easy to hide. The liquid, however, turns out to be remarkably drinkable. 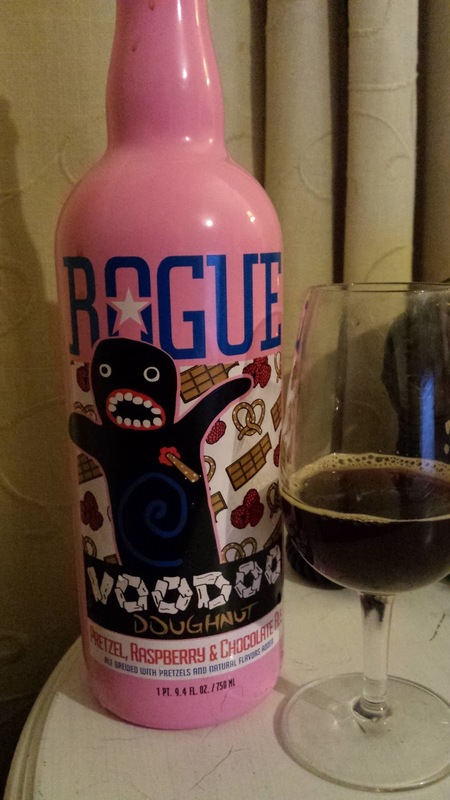 The full name of this beer is Rogue Voodoo Doughnut Pretzel, Raspberry & Chocolate Ale, but when I smelled it, the dominant aroma wasn't Pretzel, but chocolate - the kind of cheap chocolate used in Easter eggs, I think. There's also a decent backbone of malt somewhere in the background. The palate is very sweet - perhaps a little too sweet for a 5.4% beer - with plenty more of the cheap chocolate notes, along with a very enjoyable malt flavour. The raspberries provide some tartness rather than any flavour, and I couldn't pick out any pretzel at all. None at all. In conclusion, I'd have to say the packaging is something of a sleight of hand. This beer is much more sensible and beer-like than I had expected, and really rather enjoyable.